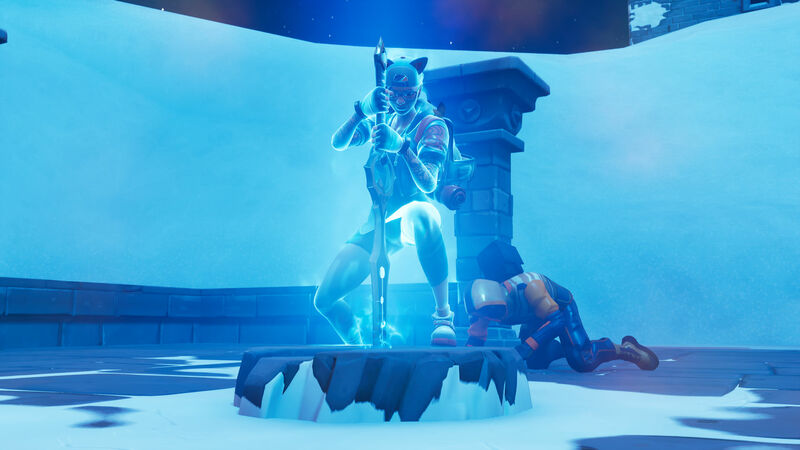 In context: To the relief of the entire player base, Epic has removed the overpowered Infinity Blade item which was released as a homage to their now defunct mobile game franchise. The Blade, which spawned once every game in the same location, gave the wielder health and shields with enhanced mobility, in addition to dealing 75 damage with each swing. But its most powerful feature was its ability to tear through any player-made structures, basically undermining a fundamental mechanic of the game. Infinity Blade was a popular iOS fighting/RPG game that Epic Games released on the App Store as far back as 2010. It was the first mobile game to use the Unreal Engine, pushing the envelope with stunning previously-unseen visuals on mobile devices. Earlier this month, Epic announced it was retiring the franchise after laying dormant and without updates for a long time on the App Store. Shortly after Epic released a new game-breaking "Infinity Blade" item on Fortnite, on the same day as the North American Winter Royale Tournament. The tournament, which Epic streamed on their Twitch channel, turned into a massive battle over the Infinity Blade where pro players tried and failed to come up with a counter. Viewers at home got a close up look at how the Infinity Blade practically ruined the metagame. Strike 1. In the couple days that followed, pretty much every player realised the worth of the Infinity Blade and the majority of Fortnite Twitch streams and YouTube videos switched over from their usual programming to make videos of themselves annihilating opponents with the Blade. Strike 2. On Thursday, Epic games published a cheerful update about the Infinity Blade to a seething Reddit, saying that they were removing the ability to harvest and build while wielding the blade – but most players said that wasn’t enough. Many Reddit users responded to the post by saying they simply didn’t want to play the game in its current state, and many echoed the sentiment that “the only thing that will kill Fortnite is Epic Games.” Strike 3 and out. A very sensible Epic games announced that they were vaulting the weapon on Friday evening (vaulting means the weapon is removed but may come back once it has been completely reworked). With the removal of the Infinity Blade, the future of the mythic weapons (which the Blade was the first of) is left an open question. Many players have requested that they are added to a new limited time game mode, allowing players to continue to enjoy them without ruining the metagame. Considering how quickly Epic responded to feedback with the removal of the blade, it’s likely this will come soon. While the introduction of the Blade was not well thought out, its quick removal shows how Epic is willing to listen and respond to their fanbase, something that’s often lacking in the industry. It’s a good indicator for the future of Fortnite.